In 17 years with the Cardinals, Bob Gibson hit 102 batters with pitches. In 1,489 plate appearances, Gibson was hit by a pitch just eight times. Mauch and Gibson were intense competitors. In a June 1962 game, Gibson was hit by a pitch from Bennett, then a Phillies rookie. Three months later, the Phillies’ Art Mahaffey plunked Gibson with a pitch. Mauch, then in his third season as Phillies manager, was trying to instill toughness in a team that lost 107 of 154 games in 1961. Gibson, in his second full season in the Cardinals’ rotation in 1962, was establishing himself as a consistent winner. By 1964, both the Cardinals and Phillies were contenders. On May 4, 1964, the Phillies went into St. Louis tied with the Giants for first place in the National League. The Cardinals were 2.5 games behind. Bennett was matched against Gibson in the series opener. In the second inning, Curt Flood led off with a home run. Bennett delivered a knockdown pitch to the next batter, Julian Javier. First up for the Phillies in the third was Bennett. Gibson’s first pitch to him was high and tight. Bennett didn’t move but glared at Gibson, according to United Press International. Gibson’s second delivery, another high fastball, backed Bennett away from the plate. Bennett moved toward the mound before he was intercepted by home plate umpire Doug Harvey, who issued a warning to Gibson. In the bottom half of the third, Ken Boyer hit a two-run triple off Bennett. Jack Baldschun relieved and yielded a RBI-single to Flood, increasing the Cardinals’ lead to 5-1. An inning later, Gibson batted with one out and the bases empty. Baldschun’s first pitch nearly clipped Gibson’s ankle. Aiming higher, Baldschun hit Gibson in the thigh with the next pitch. Gibson flipped the bat underhanded toward the pitcher. Baldschun caught it with his glove hand. Harvey immediately ejected Gibson. The Cardinals responded quickly and effectively. On the first pitch Baldschun threw after Gibson was ejected, Carl Warwick homered, scoring Jerry Buchek, who ran for Gibson, and extending the St. Louis lead to 7-1. “Six pitchers reached for their gloves in the dugout when Gibson was thrown out with that lead,” Cardinals pitcher Curt Simmons said. Gibson and the Cardinals got their revenge against Mauch and the Phillies. In first place on Sept. 20, 1964, and leading the Cardinals and Reds by 6.5 games with 12 to play, the Phillies went into a 10-game losing streak. St. Louis clinched the pennant by beating the Mets on the last day of the season, with Gibson getting the win in relief. Gibson went on to win Games 5 and 7 of the 1964 World Series against the Yankees and was named winner of the World Series Most Valuable Player Award. 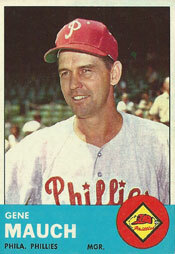 Mauch managed for 26 seasons in the big leagues, never winning a pennant. ..we still love Manager Mauch !